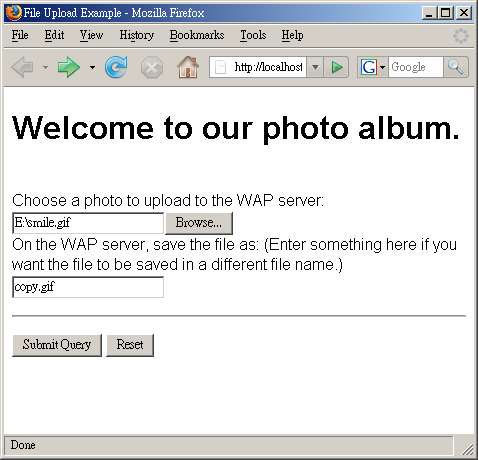 Below shows a JSP file upload script that is used to print out the name-value pair received from the earlier XHTML MP document and save the uploaded file to a certain location on the WAP server. Remember to change the action attribute of the <form> element in the earlier XHTML MP document from file_upload.php to file_upload.jsp for this example to work. The above JSP script is very straightforward. Most of the code has been covered earlier. Below shows some lines of code that you may be unfamiliar with. is used to set the MIME type of the JSP document. "application/vnd.wap.xhtml+xml" is the MIME type of XHTML MP. is used to extract the file name from a path. (FilenameUtils is a class of the org.apache.commons.io package in the Apache Jakarta Commons IO library.) For example, both FilenameUtils.getName("/files/myFile.txt") and FilenameUtils.getName("myFile.txt") return the string "myFile.txt". The above line of code is necessary in our JSP script since some browsers provide the full path of the uploaded file in the HTTP request and so after the execution of the following line, the fileName variable may contain a path but not a file name. This is because unlike WAP 2.0 browsers on cell phones, Internet Explorer 6 and Mozilla Firefox 2.0 do not understand the MIME type of XHTML MP. Instead of displaying the XHTML MP document, they will pop up a dialog box asking you to select a program to open the document or save the document on disk.